Young man with a skateboard. Legs moving in slow-mo. Sport for risky people. Vibe of the youth. Legs on skateboard in motion. 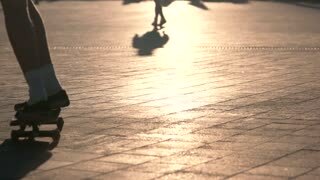 Shadow of a skater. Be bold and risky. Sport that grew into culture. Person holding a skateboard. Skater on outdoor background. Not just a hobby. Sport that inspires youth. 15. 09. 2016 Kyiv, Ukraine. Skateboard moving in slow-mo. People near a fountain. Summer days in open air. Skateboarder in the city. Guy riding skateboard. Skateboarder on bridge background. Best place for skateboarding. Modern youth chooses sport. Trick of skateboarder in slow-mo. Skateboarder on background of bridge. Youth likes extreme. Pop shove it tutorial. Guy with skateboard walking. Legs walk on pavement. Active youth chooses sport. Never back down. Skateboarder does trick in slow-mo. Feet standing on a skateboard. Pop shove it. Youth chooses sport. Skateboarder jumps in slow-mo. Guy riding a skateboard. Develop your skills. Sport of modern youth. Skateboarder jumping in slow-mo. Guy on skateboard. Speed and coordination. Hobby of the youth. Skateboarder grinding in slow-mo. Guy on a skateboard. Hobby of active youth. Work on every move. Inline skaters on ramp, slow-mo. Three people rollerblading. Sport popular among youth.